Jim Brunner Ministries, Tucson AZ: Kenya, Ematsayi Mission, Kumasi Bible School, Caribbean Outreach. Christian Support Needed. This March Noah Paul a friend here in Tucson went to Kenya on a ministry trip and carried an offering for Robert. Here is the Mutambis and Noah Paul. 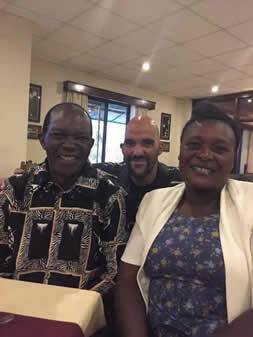 Thanks for your prayers for Pastor Robert Mutambi. He has founded the African Gospel Evangelization A.G.E. group of churches in Kenya. This group of fellowships have schools and trade schools for adults. In th summer of 1980 Jim Brunner helped Robert and others start the first fellowing in the Mathari Valley outside Nairobi. 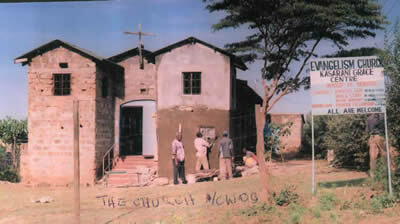 JBMI has helped this group of Churches in Kenya since that our first visit. The picture here is Bishop Robert Mutambi. Their work is in the Mathari Valley is among the very poorest in the country and their living conditions are terrible. Robert was born there and has spent his live's ministry caring for them. The new converts find new meaning in life and many time soon move out of the area because they have found new jobs and means of improving their lives through such things as his carpentry and tailoring classes. Therefore this work continues to need support and we thank you much for this prayerful help through the years. A multiple use building has been built in the Mathari Valley which is used as a facility for Church meetings, school and their vocational classes. 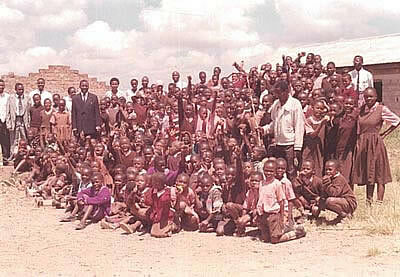 Thanks to our support the ministry continues in helping the people of Kenya in growing in the Lord. Just recently I received this email and picture from Robert for yourinformation. I quote “I hereby would like to thank those who are our prayer supporters, and I am happy to send our current Christian photo of the population of the school children which is more than we expected. We do appreciate your continued financial support." The children in the photo above are the ones being blessed by your gifts. The completed school building in the slums of Nairobi is shown here to the left and below is a picture of the recently built Chruch. The archetecture is typical of the Mathari Valley, an extremely poor area! Their ministry is called “African Gospel Evangelization" (A.G.E.). There mailing address is PO Box 74685 code 00200 city square Nairobi Kenya, East Africa. Robert's email address is rmutambi2000@yahoo.com. As the people find new life in Christ and their standard of living improves they most often leave the poverty areas to better areas of the city. Therefore the work needs continue support. JBMI has supported this work since 1980. Do pray about supporting this needy work in Kenya. God’s rich blessings be yours now and always.